The UK has issued a position paper on future customs arrangements with the EU following Brexit. In the paper the government outlines ambitious aims to be free to pursue independent trade deals while still staying close to the customs union and removing the need for an EU-UK customs border. The policy paper calls for a transition period after March 2019, during which the UK may maintain close association with the customs union but also proceed with trade talks with the rest of the world. Some EU leaders have dismissed the proposals on Twitter as “fantasy”, suggesting their respective governments would not tolerate the UK being able to make trade deals during a transition period. As a member of the EU, the UK is currently a member of the EU customs union and, like other member states, enjoys the free flow of goods between countries within the bloc, all of which adhere to common external tariffs and customs barriers, and negotiate trade deals as one. By exiting the EU, the UK is forced to take its leave from the customs union. On the one hand this means that the country will be free to set its own external tariffs and trade policies with the rest of the world, which was a major plus factor for pro-Brexiters. But it also means that it will be subject to the re-imposition of customs barriers with the EU. In its paper, the government outlines two approaches to meet its objectives of as “frictionless as possible” trade. 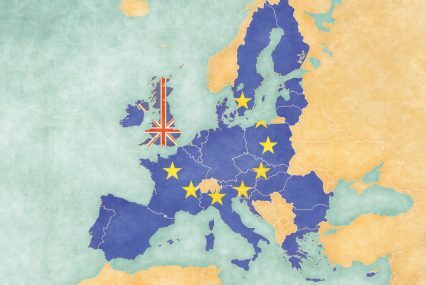 Firstly, a highly-streamlined customs arrangement between the UK and the EU, which would aim to continue some of the existing arrangements, put in place new negotiated and potentially unilateral facilitations as well as implement technology-based solutions to support customs compliance procedures. Such an approach would require development of “new innovative facilitations to deliver as frictionless a customs border as possible”, it says, acknowledging that such technology is not yet in existence. The second approach would entail a new customs partnership with the EU that removes the need for a UK-EU customs border, as the UK would mirror the EU’s requirements for imports from the rest of the world where their final destination is the EU. Acknowledging the latter as an unprecedented approach, the government states this “could be challenging to implement” and that it will “explore the principles” further with business and the EU. “In its basic proposal for using technology to facilitate trade processing at a future EU-UK border, what the UK is proposing is fairly sensible and plausible,” says senior director at think tank Global Counsel, Stephen Adams. And there may be more problems further down the road. Some market commentators have pointed out that the UK’s proposal for a variable tariff based on where the goods are going raises the issue of potential arbitrage. If the UK offers a lower tariff than the EU, the temptation for importer fraud or arbitrage could be considerable, says one source. Some have commented that the paper may be designed to play on rudimentary psychology by using an exaggerated, unlikely proposal to focus minds on a more preferred pragmatic outcome. “It is also possible that they are intended simply to demonstrate UK ambition and ultimately focus minds on the more pragmatic technological solutions and transitional period that will make the reimposition of a hard border manageable,” says Adams.